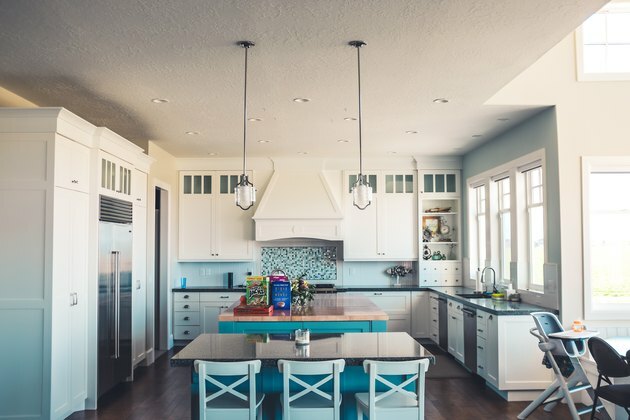 Engineered from ground quartz (silicon dioxide) and about 5 percent polymer resins, quartz is one of the most durable countertop materials on the market. It's highly non-porous and not designed to be finished, but it is possible to paint it. Doing so may significantly decrease its value if the countertop is in good condition, but it may be a good option if the quartz is damaged or stained. The best way to approach painting quartz is as if you were painting metal. You need to clean the surface well, scuff it, apply a primer and then a tough, impact-resistant top coat. Give your worn quartz countertops a makeover with a durable glossy finish. No paint on the market can stand up to abuse as well as an unfinished quartz surface, but some -- especially automotive finishes -- can come close. Automotive urethane and acrylic finishes are designed for strength, but they have to be sprayed, and that means renting spray equipment and filling the room with toxic fumes. For a less expensive alternative, you might consider spraying automotive finish from a spray can. Done properly, that can give you a smooth, glossy finish, but it won't be as durable as a professional spray finish. If you're determined to brush, consider an epoxy resin finish intended for garage floors or a polyurethane floor finish, which both have great resistance to scratches and scrapes. If the surface you're painting won't be exposed to heavy use, you could also consider a standard polyurethane or acrylic finish. Just stay away from standard latex wall and trim paints, which offer little impact and scratch resistance. Quartz Paint -- Although the name sounds as if this product is intended for use on quartz, it's actually meant for exterior use. It contains quartz powder to make a highly durable, weather-resistant, and it often contains a mildewcide. It's tough, and definitely an option, but it isn't necessarily the best product to use on an interior fixture, such as a kitchen countertop. When painting any smooth surface, it's important to clean it thoroughly to remove dirt and oily residues than can prevent bonding. You should also scuff the surface to provide an "edge" for the primer. Wash down the quartz with a solution consisting of 1 cup of trisodium phosphate per gallon of water to remove most surface oils. Rinse with clean water and let the surface dry, then wipe it down with a rag soaked in acetone or isopropyl alcohol to de-gloss it. Fill holes and cracks with epoxy resin. Sand the resin flat with 120-grit sandpaper when it sets. Rub the surface down with 150- or 220-grit sandpaper. Apply enough pressure to etch the stone, which you will recognize by a noticeable dulling of the finish. Wipe off the sanding dust with a damp rag. Cover the walls around the edges of the surface, as well as any features on the surface you want to protect, using painter's tape and masking paper. Spray a coat of metal primer or brush a coat of water-based varnish or polyurethane. Resist the temptation to skip this step--no matter what top-coat you use, it will adhere better to primer than to quartz. When finishing a smooth surface, it's always best to apply several coats, scuffing each with wet-dry sandpaper before applying the next. The number of coats and the amount of scuffing involved depend on the quality of finish you're trying to achieve. Spray or brush a thin wet coat. Aim for complete coverage, but don't worry if you don't achieve it. A few streaks are better than overloading the surface with paint. Allow the paint to dry according to manufacturer's directions--most likely between 2 and 24 hours, depending on the type of paint you're using. Sand the surface lightly with 320-grit sandpaper after the finish dries. Wipe the surface clean with a damp cloth. Build up a finish by applying paint in thin coats and scuffing. To get the best results, count on applying at least three coats of finish.